The body and brain are “plastic” and adapt to specific stresses by getting stronger. As we become stronger, adding progressive challenges continues to build on the strength and flexibility gained. Research demonstrates that strong legs are linked to a strong mind. With the systematic mobility training programs found here, regaining strength and flexibility essential for greater mobility and fall risk reduction is not a long stretch. Clinical studies continue to show strength and balance benefits using MoveMor™ for as little as 10 minutes once per week! MoveMor’s Mobility Training Framework is science-based and field tested. Progressive programming supports health success by methodically training each mobility component to help you fall less and live more! Read the Exercise Guide for complete safety recommendations. Below please find safety highlights. Sit in a stable chair with hips aligned with or slightly higher than knees. This takes undue stress off the hips and allows full ankle range of motion. For tall folks, if hips are lower than knees, place a foam balance pad or firm cushion on the seat. For shorter individuals whose feet don’t reach the ground, place a foam balance pad under the board. Board should be placed in the center and as close to the chair legs as possible to create a 90˚ angle at the knees. Ankles may be slightly forward. Without assistance available, place the board next to chair legs, sit sideways on an armless chair then turn to sit in the center of the chair. For larger feet use the strap extenders by placing the rough side on the exterior toe and ankle straps (wider and thinner respectively). The soft side will face up so you can attach the interior strap to it. Press down firmly. Sit tall with good posture; buttocks as far back into the chair as possible, chest lifted, shoulders back and down with ears aligned over shoulders and hips. Breathe deeply throughout the exercises. Place one hand on your belly while breathing to make a “big balloon belly!” Exhale by squeezing belly button towards your spine. This will help strengthen your diaphragm muscles and support good posture. Move in a comfortable, pain-free range of motion. Pain is your body’s signal to stop. Muscles tighten up as a protective mechanism when pain is experienced. If mild pain occurs, decrease your range of motion by making the movement smaller. If needed, you may reduce the tubing resistance. If pain persists, stop the exercise and consult with your healthcare professional. When exercise is completed, remove the board and store upright away from light, heat and water sources. Below please find recommendations to use MoveMor™ to gradually increase strength and flexibility. Always listen to your body’s innate wisdom and do the best that you can. Exercise should energize you! Warm-ups and a seated stretch are provided and are recommended but optional since MoveMor™ is a gentle exercise. Warm-ups prepare body and mind for exercise; build circulation and warm-up muscles. Stretching can further enhance flexibility. Use MoveMor™ for 10-20 minutes, 1-3 X/week on non-consecutive days to allow for adequate rest and recovery. Perform each exercise program for 8-12 weeks to maximize neural and strength gains. With good form and posture, move onto the next program. When the resistance is no longer challenging, increase the tension underneath the foot beds then progress to the next tubing level for a greater strength challenge. Once comfortable with the lower body exercises, tickle your brain by coordinating upper body movements with the lower body exercises. 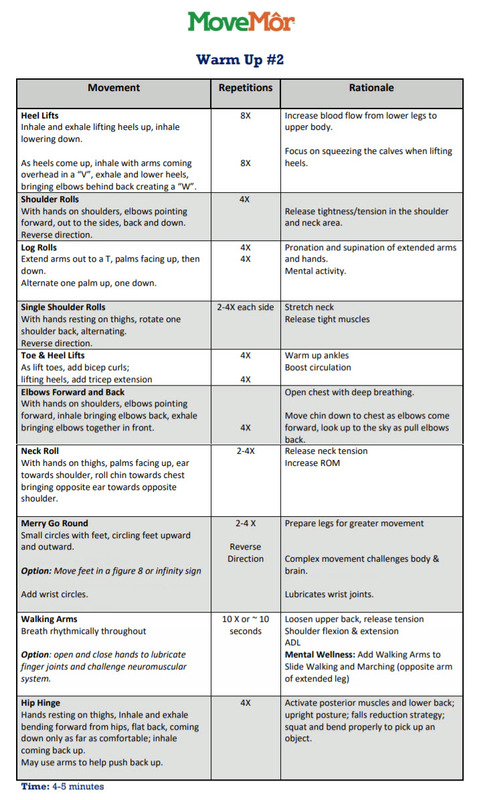 Most program sheets include upper body suggestions or get creative! Remember to sit tall, breath and have fun! Purpose: Prepare the body and mind for greater movement. Focus on: Breathing, increasing circulation while loosening up the upper body which translates into movements needed for activities of daily living. The objective is to increase blood flow, lubricate joints and stimulate the neuromuscular system so the brain, nerves and muscles are working well together. Begins in the belly (think “balloon belly”) and then up into the chest; Exhale in the reverse direction from the chest and then squeeze the belly button towards the spine. In general, inhale prior to moving and exhale during the initial movement as feet move out and away from neutral (exertion phase); inhale as feet move back towards neutral position (relaxation phase). Purpose: Base conditioning to improve joint flexibility and strength. © 2018 Resistance Dynamics, Inc.